May Holiday weekend and we were supposed to be camping but the Scottish Spring put paid to that idea. 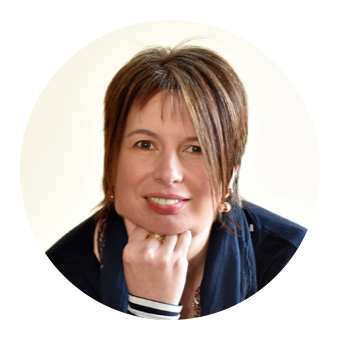 We were also celebrating our 18th wedding anniversary and I didn't relish the thought of waking up freezing cold in a tent in the snow. 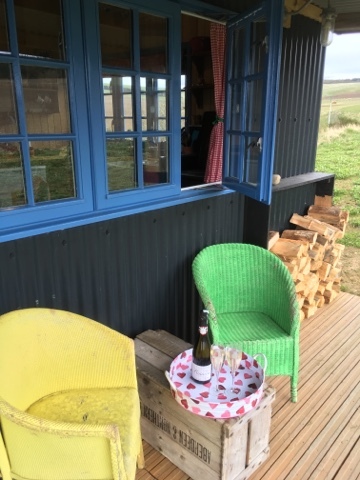 A last minute panic to find an alternative led me to Barley Bothy where there had been a serendipitous late cancellation. 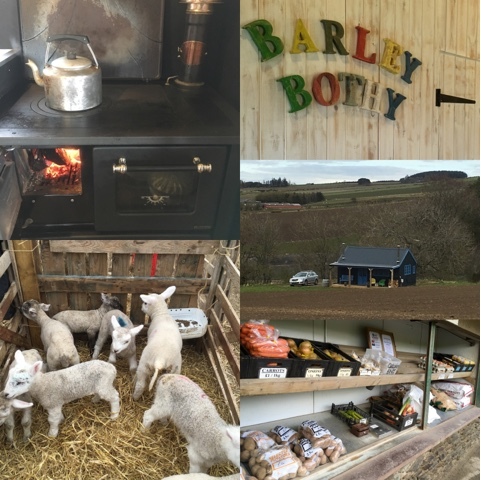 The story of Barley Bothy is well worth watching on Ch4 OD. 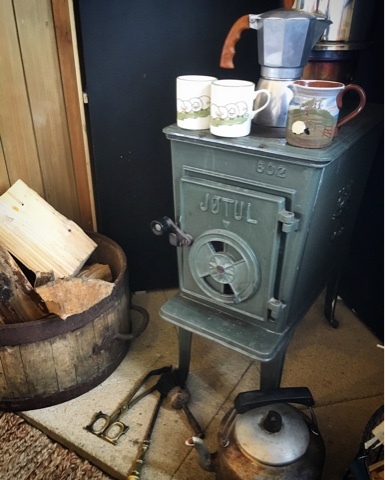 It was made by owner Jane's Dad in the West Country before being broken into two parts and transported 600 miles to their sheep and barley farm near Huntly in Aberdeenshire. At the moment a second smaller bothy is being manufactured which will be known as the Sheep Shed and will sleep two. It should be in situ by late Summer and can thankfully be transported in one piece. Seriously photo heavy post as that's really the best way to share the experience but suffice to say that we absolutely loved our short stay. Enroute we stopped off at Lower Thorneybank Farm Shop. I love an honesty box and eggs, tatties and veggies were purchased. 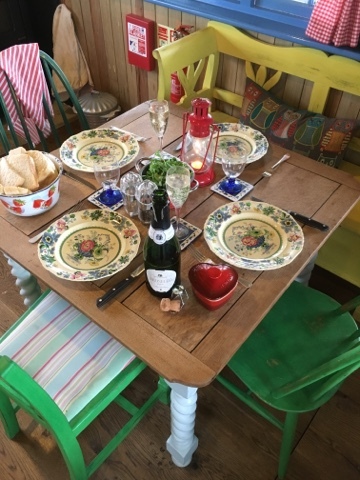 At Barley Bothy we were welcomed with crusty bread, homemade strawberry jam, porridge oats, sticky toffee pudding fudge and a lovely additional touch of a bottle of Prosecco in the fridge to celebrate our Wedding Aniversary. 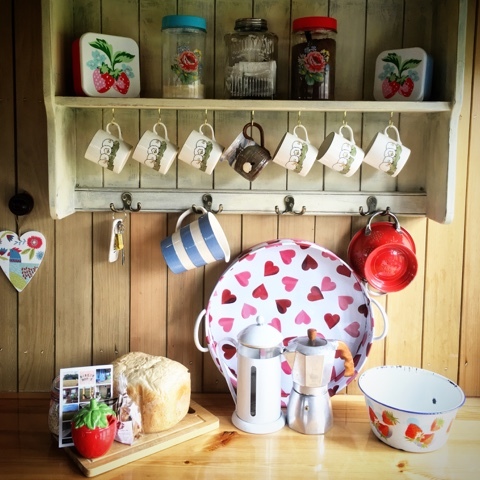 The bothy was very well kitted out in terms of cooking equipment, basic supplies and extras such as hot water bottles, glamping colouring-in book, board games and a picnic hamper. 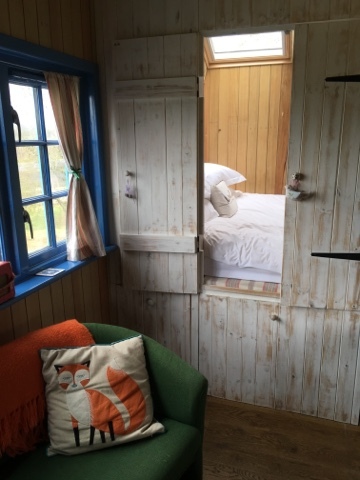 We settled in really quickly and tried out the traditional Scottish box beds which are basically king sized mattresses enclosed in cupboards. These were so cosy and comfortable but are a bit of a clamber to get into. Fear not step stools are provided. Storage is in large drawers which slide out underneath. Fantastic use of limited space and wonderful stargazing windows above each bed. Plenty of firewood was provided which is a good thing as that's how you'll keep warm and cook your food. 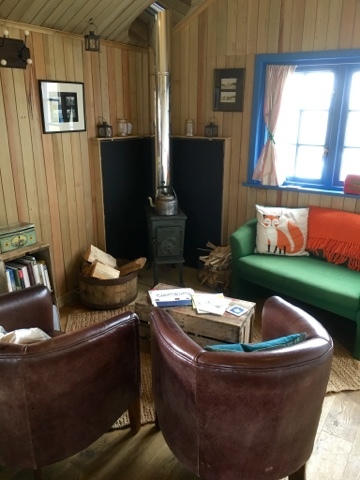 There's a wee wood burning stove in the lounge area which can also be used to boil a kettle and in the kitchenette there's a small wood fired range cooker. I've cooked on an AGA and on an open fire but this was my first foray into a combination of both. Thankfully my boy scout son agreed to take charge of the fire which needs approximately 45 minutes to get up to full heat and must be regularly stoked. 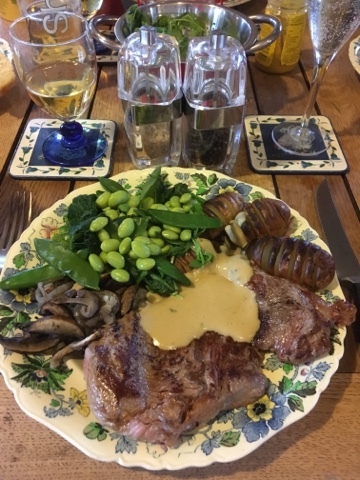 Our anniversary feast consisted of Ribeye Steak, Peppercorn Sauce, Hassleback Jersey Royals, Mixed Greens and Fried Onions & Mushrooms. All washed down with Prosecco and finished off with Coffee and Fudge. A full cooked Scottish breakfast was the order of the day on the holiday Monday following a visit to the farm to see the lambs that had been born overnight. 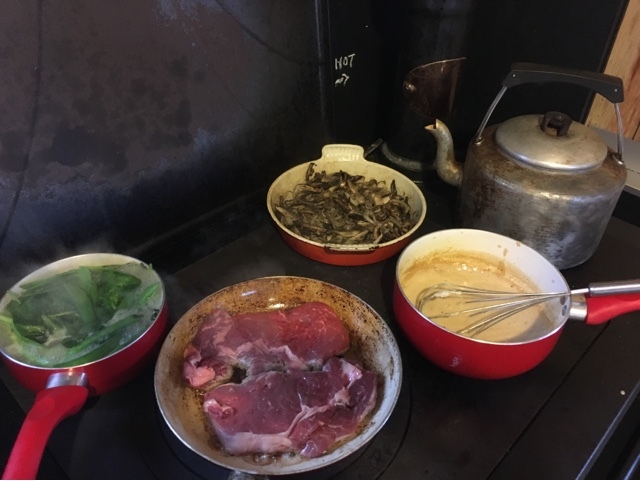 The forecast snow had failed to materialise but bothy life was still preferable to camping and a step up from glamping. 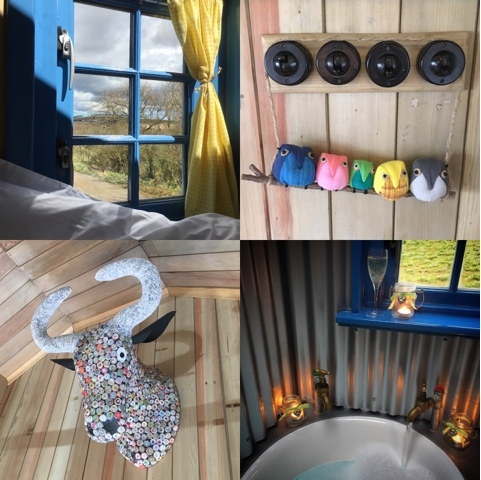 We loved all the bright colours wee quirky touches in the bothy and I particularly enjoyed my luxurious candlelit bubblebath with prosecco. The views were fantastic and we enjoyed sitting on the veranda (henceforth know as the Miranda) reading books and playing cards. 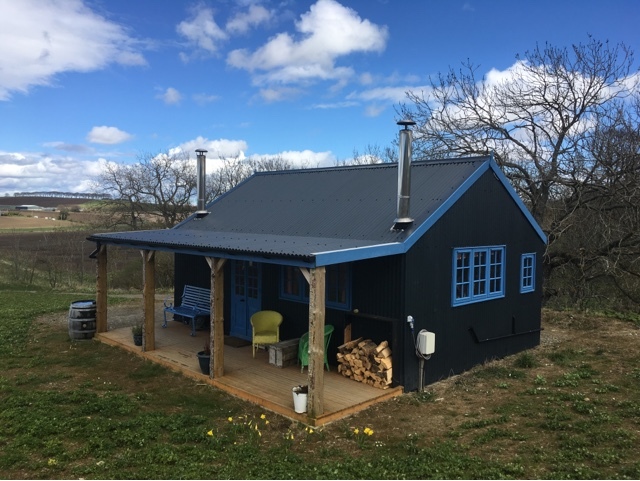 Spending quality time with loved ones is what a stay at Barley Bothy is all about. I wonder where our next trip will take us? 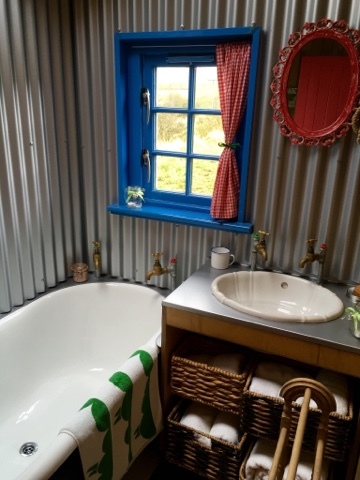 If yours leads to www.boutiquefarmbothies.co.uk be sure to tell them I sent you. It looks great - I always love the unusual places you stay... If I go I'll definitely say you recommended it! Oh gosh this looks like my idea of heaven! 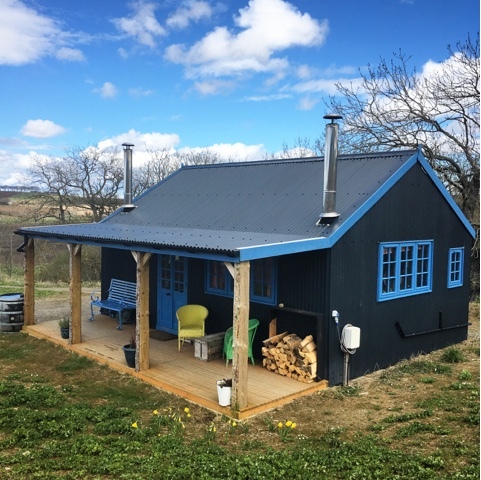 What a super place to stay! What a great place! Beds in cupboards and the bijou kitchen sound and look fab. I looks soooooo beautiful - the sort of place I would love to go for my celebrations. 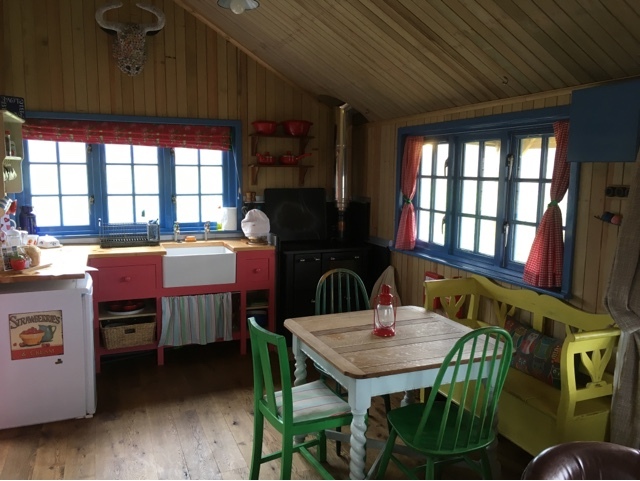 Wow this looks like a perfect little place to stay and those furnishings are so cute!